Easter 2013 looks wet & stormy for the Gold Coast and south-east Queensland based on the latest forecast issued today. For those wishing for a dry Easter may not get what they are looking for after the Bureau's Southeast Coast forecast issued at 4:10pm today has indicated that showers and storms are likely over the long weekend. 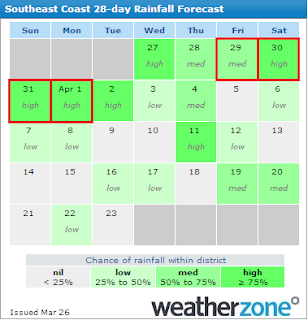 Additionally the Weatherzone 28-day Rainfall forecast has changed quite a bit since we looked at it last with the entire Easter long-weekend showing a medium to high chance of rainfall, and the remainder of the school holiday week showing possibility of being wet as well. But it's not all bad news, as the latest computer generated rainfall forecast maps at least for Good Friday and Easter Saturday currently indicate there's less than 5mm of rain expected across both days - so there might still be periods of sunshine and good weather amongst the passing showers and possible storms. 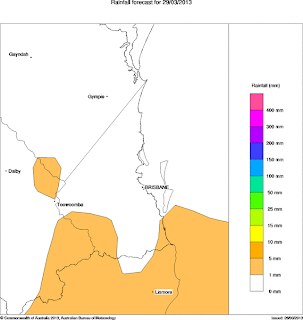 A southerly change is likely to move north through far southern waters and combine with an upper trough over southeast Queensland to produce isolated showers and thunderstorms over the southeast. Isolated showers and possible thunderstorms about the southeast of the state. 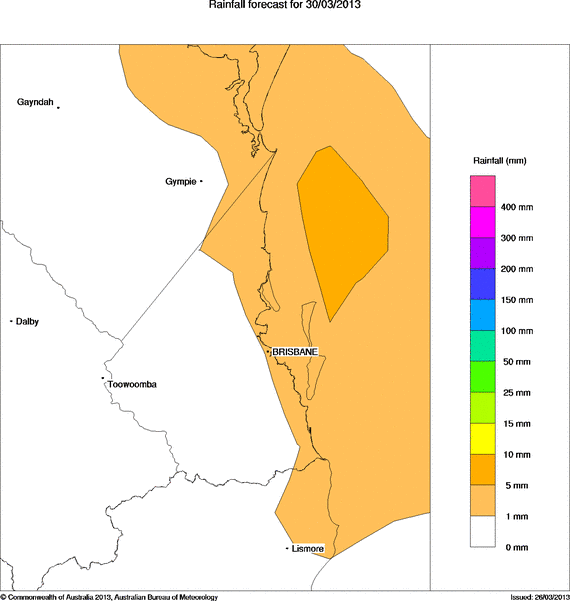 There is some uncertainty for the outlook period, but an upper trough is likely to move eastwards across the south of the state on Sunday before clearing off the southeast coast on Monday. The surface trough should also continue moving east over southern Queensland, and is likely to reach the southeast of the state on Sunday and Monday. 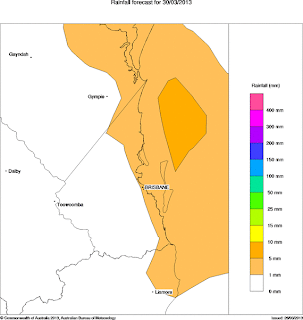 Showers and thunderstorms and rain areas are expected to develop near and east of this trough during Sunday and Monday, before clearing offshore to leave isolated showers about the east coast on Tuesday. All Gold Coast beaches are now open after beach restoration works hit top gear. Beach maintenance works and a change in the weather and ocean swell are having a positive impact on the city’s beaches. Mayor Tom Tate said the hard work by Council maintenance crews had resulted in some obvious changes to Surfers Paradise beaches. “Our crews have been hard at work from 6am to 6pm six days a week, and are making great progress to ensure our magnificent beaches are brought back to their best ahead of the arrival of holiday crowds,” he said. The Mayor said that added to Council’s efforts, he welcomed the valuable contribution that other were also making to the beach works. “Its been phenomenal to have the State Government, GoldLinQ, and developers get on board, supplying the city with high quality sand,” he said. “Sand is being placed on Nobby Beach from a development site, along with a contribution from GoldLinQ to nourish the beach immediately in front of the Nobby SLSC. “The Council is also working with the Gold Coast Waterways Authority to dredge 60,000 cubic metres of high quality sand to replenish beaches from Surfers Paradise northwards. These works will take place after the Easter holiday period. Maintenance crews expect to relocate an estimated further 5000 cubic metres of sand over the next week. seven lifeguard towers were temporarily relocated.